As our loved ones age, we often have a whole list of concerns of things that could impact their health, such as their diet and medical care, but research shows that we should be thinking of their social needs too. Social isolation among the elderly can be just as detrimental to their health as a poor diet or lack of care. Why does social isolation happen? Social isolation can happen to seniors who gradually lose their physical mobility or develop health problems that force them to withdraw from their social routines. Other times, the death of a spouse or living far away from any relatives can interfere with keeping connected to the community around them. While assessing the care your elderly relatives may need, don’t underestimate the importance of preventing social isolation. Seniors living in social isolation will statistically live a shorter life than those who do not. For someone who has a history of heart attack or stroke, the risk of death can run even higher. Living alone has its own inherent dangers. Falls, illness or other health problems can quickly escalate into something much more dangerous for a person living alone without frequent visitors. An example would be an elderly man who lives by himself and falls and breaks his leg. 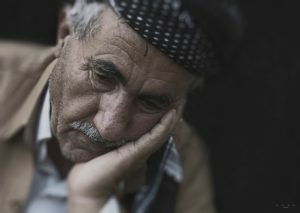 If he’s socially isolated, he may not receive help for hours and could suffer from other problems like dehydration that could put him at risk of dying. Other risks of social isolation come from not having other eyes on a senior’s living situation. Frequent visitors are more likely to identify potential dangers, such as bad wiring, a loose rail or broken step. They may also notice problems with medication or diet. Imagine a daughter visiting her mother to discover no food in the house. The mother, a life-long cook, was forgetting to buy groceries and forgetting to eat. This and other observed idiosyncrasies led to the discovery that the woman’s mother was suffering dementia and could no longer safely live on her own. Not having someone to call for help, help identify dangers or assist in getting medical care spells danger for the elderly. The mental toll social isolation can take on the elderly can be just as devastating as the physical problems. Research has long shown that humans, like most animals, are social beings and need interaction with other people to thrive. Seniors who don’t have any emotional support are more likely to suffer anxiety and higher levels of stress. Depression can also be a major problem for the isolated. In addition, social isolation helps open the gate to dementia. In taking into account what care your elderly loved ones may need to keep them healthy, avoiding social isolation needs to rank near the top of the list of concerns. So how do you ensure your loved one doesn’t lose all his or her connections to the outside world? First, if your senior relative lives alone and you live in the same city, stop by for regular visits! Plan activities together to get them moving and engaged with others. Encourage and maybe even facilitate participation in meetups, get togethers with friends, picking up a hobby or volunteering. 1. Address any mobility issues. A major factor in an elderly person becoming isolated is their mobility. It becomes too hard to walk long distances. But a cane, walker or scooter could solve that problem. Assess the situation, figure out what is needed, and ensure it is in place. 2. Provide access to transportation. A lack of transportation stands as one of the biggest reasons behind social isolation. 3. Help them find a purpose. The elderly can be a golden resource for volunteering, whether it’s holding babies in the hospital, reading to children or walking shelter dogs. 4. Address Incontinence: Incontinence is another reason why a senior might cut themselves off from friends and going out in public. Follow through with doctors and caregivers to deal with the problem effectively. At some point, you may realize that there is no way to keep your loved one healthy either physically or emotionally if they continue to live on their own. And then you must consider either bringing in a caregiver or placing them in an assisted living residence. Here at Paradise Living Centers, we prioritize a comfortable living environment with an engaging lifestyle. We encourage recreational fun by hosting weekly activities such as crafts and music, quarterly outings and family events; offering pet therapy; and having large spaces in each of our homes for entertainment and socializing. We provide ample opportunities for meaningful interaction for our residents to have with each other, staff and family. We want to make it so social isolation is one less concern you have for your aging loved one. If you’d like to learn more about Paradise Living Centers and what we do to ensure our residents don’t experience social isolation, visit our website or call to schedule a tour at (480) 878 – 4112.